To my own surprise after wondering what would be my top 10 places to visit in Kyoto most of them were free things. It’s not only because I’m broke and cheap (okay, maybe it has something to do with that fact…). Kyoto just has many free and beautiful attractions! So here is my top 10 list of things to do when visiting Kyoto (most of them free or cheap). I spend almost two months in Kyoto so I visited most of them several times. If I had only a one day in Kyoto these are the ones I would be considering to visit. Whatever you were deep thinker or just doing touristy things around Kyoto Philosopher’s Path is something you shouldn’t skip. I recommend visiting during fall (the colors are BEAUTIFUL) or during cherry blossom season. Philosopher’s path follows small canal for two kilometers. There is cute small cafes, shops and small temples to visit during your walk. Or if you are deep thinker you may want to follow the foot steps of Nishida Kitado who is one of Japan’s most famous philosophers and who used to walk this route and meditate. Philosopher’s path starts/ends to Ginkakuji temple that is place worth of visit on its own. It may seem stupid to include aquarium in this list because you can find them from anywhere in the world. Fortunately I am not one to follow general opinions. I think I have said this before but if you want to make me fall in love with you just take me to the aquarium. Seeing colorful fishes, sharks, etc. is amazing what ever country you are currently. Penguins, jellyfishes and pet a sea animals corner made me spend too many hours in this dark huge aquarium. There was also dolphin music show and a lot of souvenirs to buy. I recommend this for all fellow aquarium lovers! You can use hours after hours just getting to know all the shops and trying different foods. Get your the best city tips and current events from tourist information. And like I said that observation deck and its Happy Terrace are one of the secret wonders of Kyoto. My plan was to visit here on my last week in Kyoto but then I didn’t have a time. I can however recommend it for everyone because I did hear so many good reviews of it by the other hostel guests. Manga museum is just what it sounds like… building full of mangas you can read! Majority of the books is in Japanese but there is also section for other languages. Manga museum is located in old elementary school so in addition to all the mangas you can experience the atmosphere of Japanese school life. Admission costs 800 yen (and special exhibitions have their own prices). However there is “special” days when the admission is free for everyone. Let’s play association game once again! When I say Japan what do you think? I would guess that at least some of thought beautiful geisha. If that is what you wait from Japan then going to Gion is your best bet of succeeding in ‘geisha hunting’. (Don’t hunt geishas please… They are working so if you see them be considering). Gion is often referred to be the old district of Kyoto. The buildings are photogenic and the shops offer free food samples of traditional Japanese snacks. There is one ‘main street’ but don’t be scared to part from it and wander around the smaller streets. I don’t recommend eating here even if the restaurants seem tempting (the prices are totally touristy/expensive). Be aware that there will be a lot of people and possibly waiting to get in. In the end of this walk through the area you can find small food and souvenir stalls. Don’t just run past them even if I don’t recommend buying anything (the prices are high). Try the free food samples because they have some options that aren’t so popular in other parts of Kyoto. I tried to not put too many shrines and temples to this list but with Kyoto it is impossible. I would do own list for those because I visited so many on my time in this historical city. Kiyomizu-derra is place I hope I could have found earlier during my stay. It’s not even the temple that charmed me but the area around it. All the small shops, tiny alleys and old buildings. Even if you feel like paying the 400 admission fee is too much for you to handle I recommend visiting the area. You can’t see the main temple but there is a lot more for this place. There is also many pop culture (and kpop culture) shops for those who share my interest in this area. When you see cool Japan travel photos with bamboos I would bet they are taken in Bamboo forest. It is one of the places Kyoto is popular for. Warning: Its popularity means too much people and if you go wrong time you probably can’t take that perfect bamboo photo without dozen tourist heads disturbing you. I recommend morning or just before sunset. At first I was surprised that Kyoto doesn’t have that many museums. But after visiting the ones this traditional city has I didn’t have any more complaints. Municipal Museum of Art was amazing and I didn’t even go inside the museum. Unfortunately when I meant to visit I hadn’t checked the timing correctly and it was already closed. However you can always visit the museum’s garden and let me tell you it was enough art for me. There was countless amount of modern art pieces during my visit. And when you are at it Kyoto Municipal Museum of Art is located perfectly. It is separated from Kyoto’s National Museum Of Modern Art by huge torii gate (see photo above). Close to the museum is also Kyoto zoo and popular Heian Shrine. My favorite place in Kyoto, Japan and maybe even in the whole wide world! If you have learned about Japan and/or about it religions you have probably seen photos of Fushimi Inari and its endless rows of torii gates. Fushimi Inari, Fushimi Inari Taisha or Mt. Inari is mountain dedicated for fox god. The mountain paths are surrounded by thousands of red gates that are donated by Japanese businesses. Hike up the mountain is going to be tough so I recommend good shoes and a lot of snacks. Don’t be scared to take the not so beaten path because this mountain is full of surprises and secret wonders. I know, I know… Once again I was late with post. Sorry, but I think you are already used to me not following my own rules. I’m waiting excitedly the day when I can write all my posts on the right days. We are going there (slowly) so please bear with my laziness for a little while longer. Like always comments are welcome! Have you visited Kyoto and what were your favorite places? Or would you like to visit there some day? It’s the last day of year 2016 and I have decided to (totally not be original and) write summary of my travel year 2016. My year started with being happy to be finally back at home but still missing my amazing three months in Japan. At this state of my mind I also started this blog! One of the best decisions of my year I think. Who said after travel blues can’t cause good things to happen. The first trip of my year was to France! I was invited to spend two weeks in sunny Montpellier. I got to see the beautiful beach towns, old streets and kind French people. This year was also full of shorter cruises because my schedule was quite booked with the school. I did family cruise to Sweden and travelled to Tallinn for the first time (and for the second time to see the Christmas Market). End of my summer was full of university exams around Finland so I did more than a few trips around the country. Sometimes it’s good to explore your own home country and see what is has to offer. For example I visited Helsinki, Seitseminen National Park and moved to new city. The biggest travel I did this autumn was to London. I got to visit Harry Potter attractions and see a lot of things I had seen when I was younger. Everything is in different point of view when you see it for the second, third or fourth time. My travel bucket list post of me explaining what are my biggest travel dreams. My travel post about seeing Tallinn’s Christmas market. My travel diary to London. 30 travel things I want to do before I turn 30 years old. So all in all I have had quite good year, right? A lot of travelling but I think my next year is going to be even more full of adventures. How has your year been? And how are you going to spend the coming year 2017? So, I may have been lazy once again… If you are new here in my blog: Hello, I am the person who never follows her own schedules! But well because I have been busy (this not excuse, okay? I have really been busy) I can’t publish today the last part of my abandoned amusement park story time. I’m sorry everyone who has now waited for too long for me to finally finish it. Right now I am in train going back home. Today I had crazy fun day in Helsinki. (And I even met up with fellow blogger for the first time! Thanks for Anub who was nice enough to not complain about my bad pronouncing or the terrible Finnish coldness.) So because I have nothing else to share with you today here is small photo diary from Helsinki. I hope you will enjoy it! I admit that I still love this view even after seeing it one time too many. In moments like this I can kind of understand why people want to visit Finland. However that doesn’t mean I will stop making fun of my beloved home country and our non-existing tourist attractions. Unfortunately, there wasn’t any snow in Helsinki. But even like this the city is beautiful and has its own charm. And we of course saw a lot of frozen places so maybe that makes up for all the missing snow? It’s not true Finnish experince if you haven’t almost fell over while walking on ice! 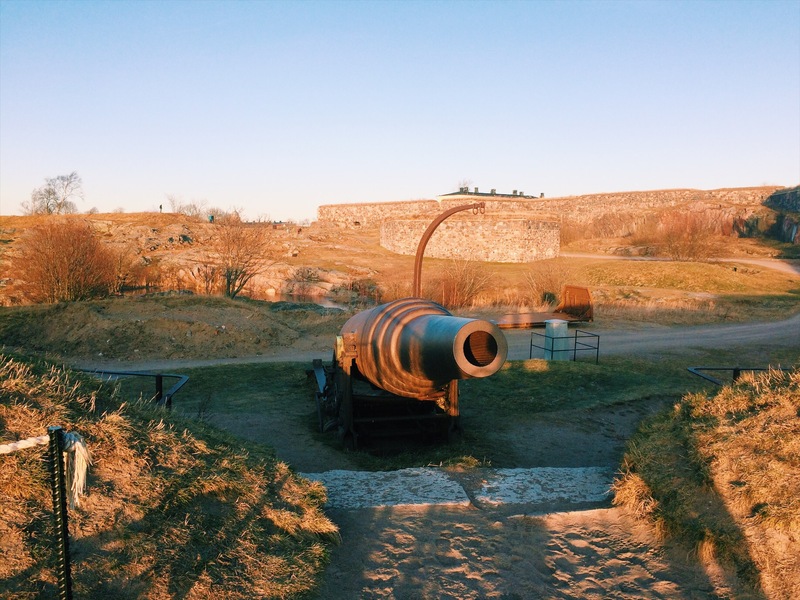 One of our day’s major things to do was visiting Suomenlinna sea fortress. It’s been over five years from my last time here and I didn’t even remember how much I used to love this place. Suddenly I even remembered that as child my dream used to be grow up and live my life in this tiny cozy island. It took us a while to find the right restaurant (that may totally be my fault and it probably has something to do with my bad luck while travelling) but finding the place was totally worth it. 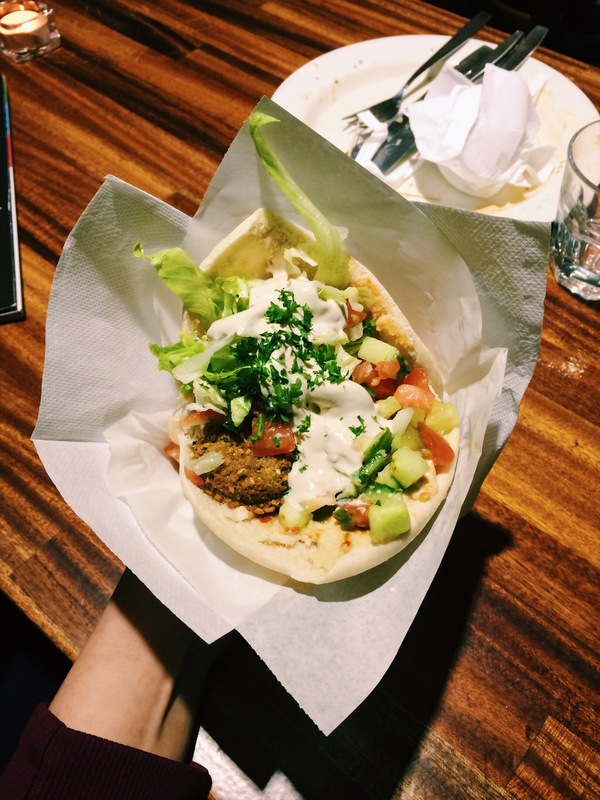 I haven’t eaten falafel for so long time so our choice was the best possible. Sun is setting in Finland guess what time it is! So if you don’t know northern countries have super short day’s at winter. So the sun was setting already at 3pm. 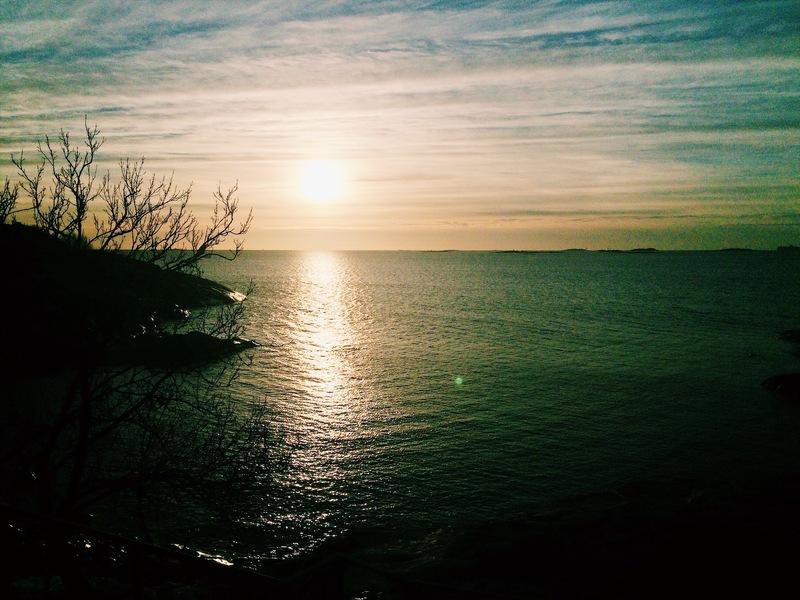 The last photo is me sharing my favorite Helsinki spot with you. I have always loves Senate Square. Now there was huge Christmas market but at other times of year you can meet funny tourists taking photos and just enjoy the beautiful view. I may have biased opinion about this matter so you shouldn’t probably believe my tip… I have had some of my best teen memories in this square. Being part of flashmob, meeting amazing people and doing crazy things. I hope you are having an amazing weekend and that you are being more productive than I have lately been. And like always all comments are welcomed. 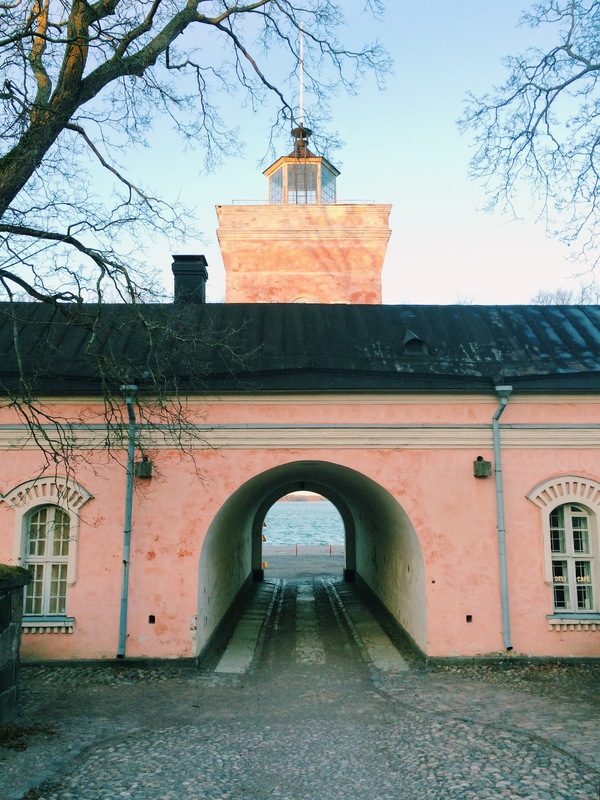 Have you ever visited Helsinki? Or met fellow bloggers for fun travelling day?